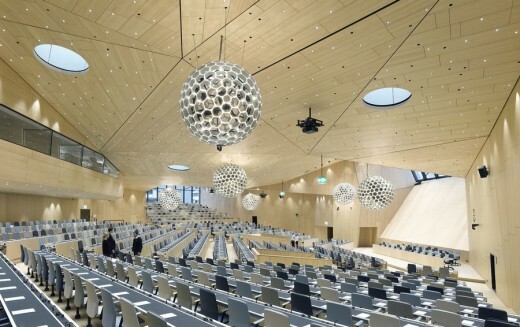 Internationally recognized architecture firm, Behnisch Architekten, has announced the completion of the new conference hall for the World Intellectual Property Organization (WIPO), which the firm designed. Located in Geneva, Switzerland, WIPO is a self-funding agency of the United Nations, with 188 member states. The conference hall, which can accommodate approximately 900 delegates from around the world, lies between the organization’s main building, known as Bâtiment AB, and the WIPO administration building, which was also designed by Behnisch Architekten and was erected in 2011. 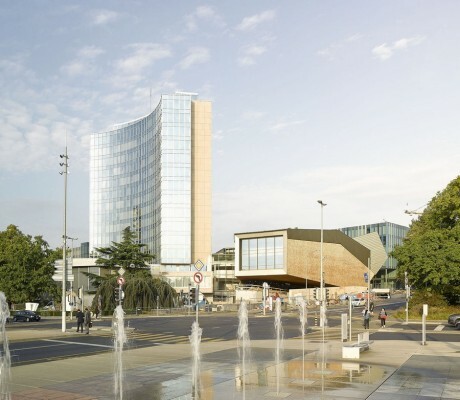 The three buildings comprise the WIPO campus at the United Nations’ Place des Nations. 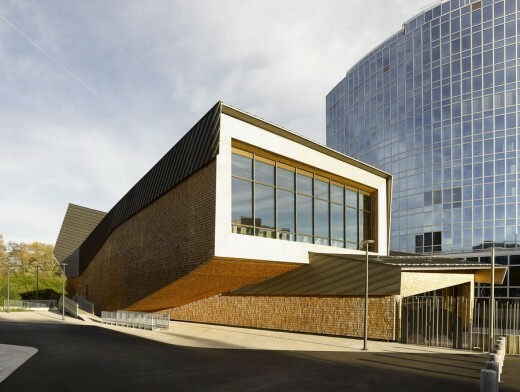 A predominantly opaque structure, the new conference hall sits slightly raised above the level of Place des Nations and opposite a row of villas. Despite its large volume and introverted appearance, it is light and approachable. From its fulcrum, arms cantilever out to create openings framing picturesque views, such as that of the Mont Blanc massif. The structure is placed like a sculpture between the two buildings, within the WIPO Garden. The building’s ample lobby is a continuation of the Garden landscape. Structurally, the lobby separates the hall from its base, allowing the building, seemingly, to levitate. 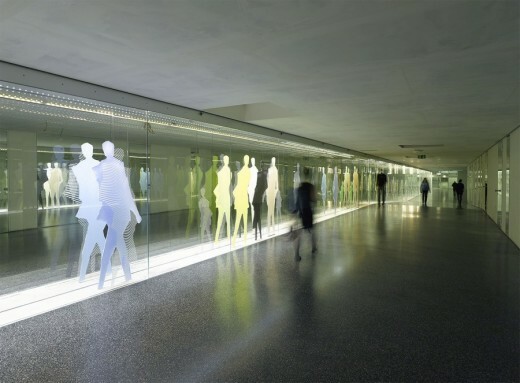 It is accessed through a newly designed main entrance, which interfaces with the main AB building’s lobby at the same level. 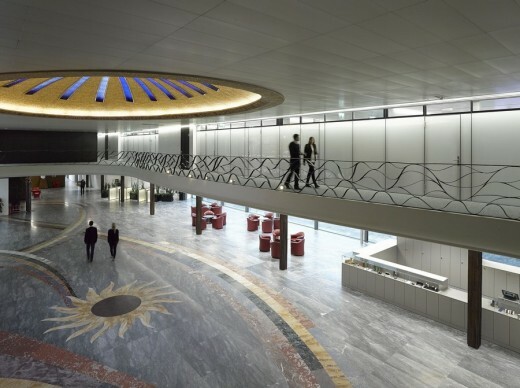 An interconnection of ramps and staircases, the lobby channels visitor flows and houses security installations. The auditorium is located on the second and third floors of the new building. 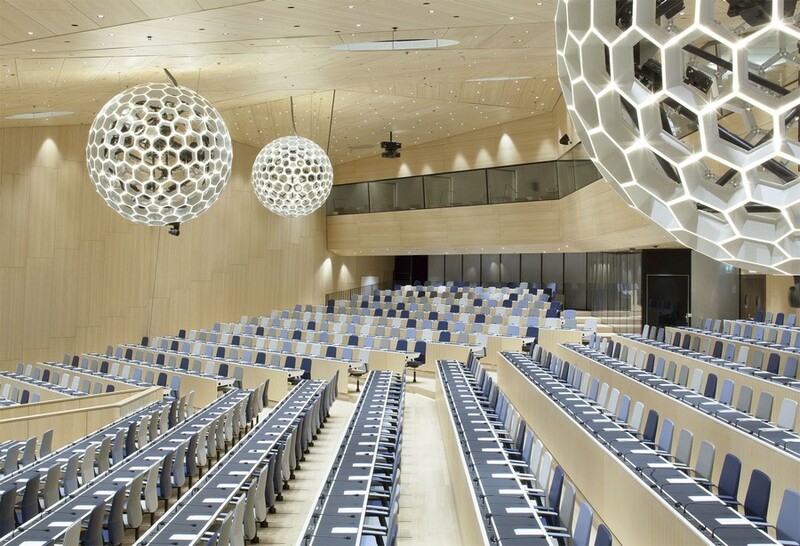 It contains furniture and lighting elements, also designed by Behnisch Architekten, that include conference tables, light spheres, and 900 state-of-the-art conference seats, which are oriented towards the stage without hierarchy. 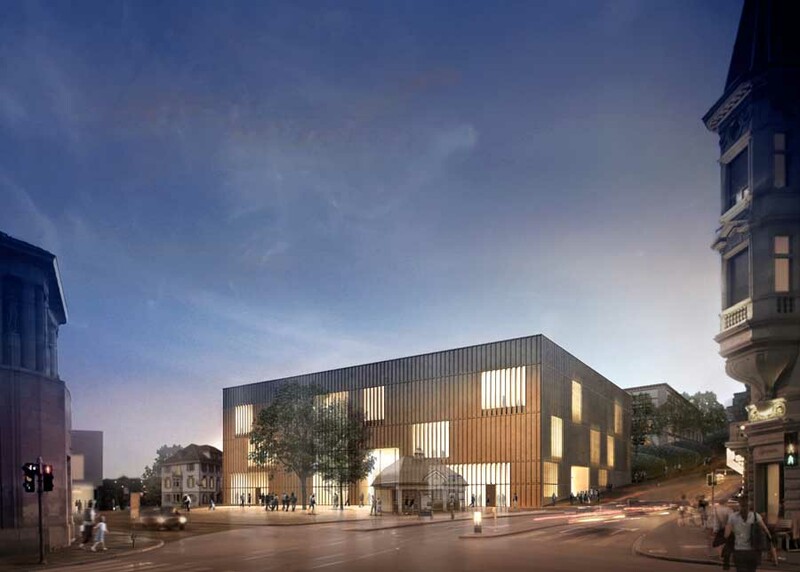 The hall is designed to ensure user friendliness and comfort, and is filled with daylight, which streams in through the north facing glazing above the stage. Timber is the prime construction material of the new hall and dominates its structure, interiors, and façade, which is clad in larch shingles. The building’s design, with cantilevers of up to 30 meters in length, pushes the limits of timber construction. This choice of material and all choices in this project are based upon the attempt to create ecologically, economically, and socially sustainable built environments.